As 2012 closed, I decided to stick with the challenges that I participated in 2012 because I liked them all, but nothing more. 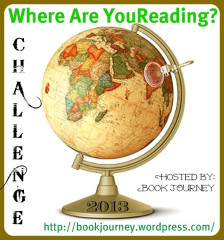 In this challenge, I keep a Google Map (link to my google map for 2013) and place a pinpoint at each spot where a book takes place. The link to my google map will also be in the sidebar all year round, so anyone can check out where I have been reading! If you would like to participate - check out Book Journey. So the blog that hosted this one last year, is now no longer, which is sad because this is the only one that I definitely overachieved I will continue with this challenge, so if anyone is in with me to challenge how many ebooks you read in 2013, please leave a comment below and depending on interest, I will get something formal up and running. I failed at this challenge in 2012, but am bound and determined to do a better job with this one in 2012. I have probably overcommited in the Making a Dent category, hoping to read more than 30 books off my shelf that arrived before 2013 began - we shall see! I will have a label for this again in 2013 and hope to see it all over my blog this year! 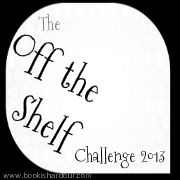 If you would like more information on this challenge, check out Bookish Ardour. I love the map challenge! What a great idea! I love the off the shelf idea!